Home Games and Entertainment Marvel Marvel Comics Nexxlegacy Pre-Order Disney Infinity: Marvel Super Heroes Today! Pre-Order Disney Infinity: Marvel Super Heroes Today! 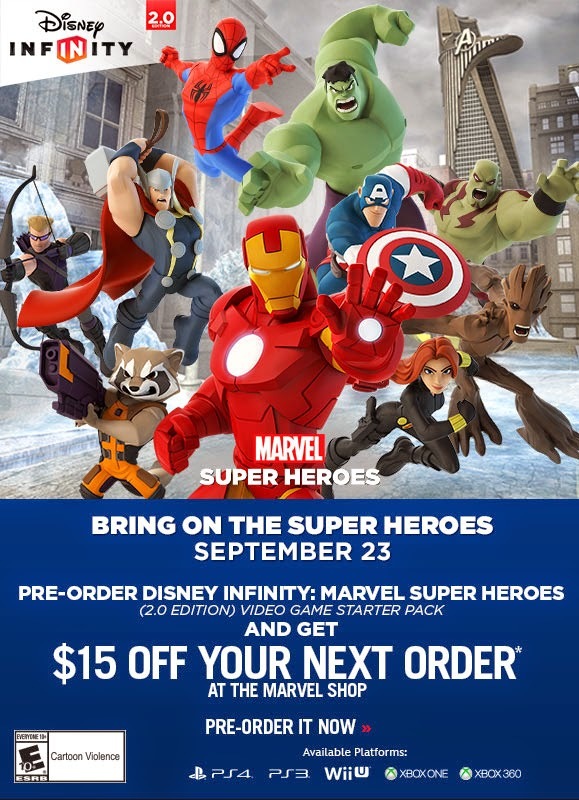 Pre-Order Disney Infinity 2.0 and receive $15 Off Your Next Purchase Promotion Restrictions: *Pre-Order Disney Infinity Marvel Super Heroes Starter Pack for XBox 360 by 11:59PM PT September 22, 2014 and get $15 off a future online purchase at Marvelshop.com. An e-mail will be sent at the conclusion of the pre-sale with a unique promotion code valid for a future purchase online at marvelshop.com made between September 23, 2014 - October 5, 2014. Infinity 2.0 pre-order offer begins on September 23, 2014 and expires 11:59 pm PT, October 5, 2014 and only valid on a single purchase at marvelshop.com. $15 off offer applies to any order of $15 or more. Cannot be combined with other offers. Offer excludes Shipping & Handling charges, Gift Cards, Music, Books, Electronics, Limited Edition merchandise, Limited Availability merchandise, personalization, and items not in stock. No adjustments to prior purchases. Merchandise must be exchanged for identical item or returned at discounted price with valid packing slip. Offer valid on phone orders and orders placed online at marvelshop.com. Promotion Code may not be redeemed for cash. Limit one Promotional Offer per Household. Promotion Code may not be sold, altered, duplicated or copied and will not be replaced if lost, stolen or corrupted. Use of Promotion Code is acceptance of its terms. Marvelshop.com reserves the right to cancel or modify this offer at any time. Void where prohibited.